It has taken Milestone Apartments REIT more than two years of operation as a public entity to acquire US$500 million worth of garden-style apartments in U.S. Sunbelt markets. Last month, the Dallas-based REIT (MST.UN-T) matched that two-year-plus history with the stroke of a pen. The growth spurt came about with a US$1.9-billion joint venture acquisition with Starwood Capital Group of the Landmark Apartment Trust. With the deal, Milestone will acquire a 100 per cent interest in 15 properties (4,172 units) currently owned by Landmark, while Starwood will acquire Landmark’s interest in 63 properties. All of the holdings will be property-managed by the REIT. The deal is expected to officially close early next year with Milestone’s share comprising US$502 million. It is the first time Milestone has made a portfolio acquisition since its March 2013 IPO. “We have made 12 one-off acquisitions since we IPO’d,” said Robert Debs, head of investor relations with Milestone. The REIT’s series of acquisitions prior to the Landmark deal are nearly equal – 4,052 units for US$509 million – to what it will acquire as a result of the Landmark deal. Prior to the Landmark acquisition, the REIT’s portfolio consisted of 61 multi-family garden-style residential properties, comprising 19,908 units located in 14 major metropolitan markets in the Southeast and Southwest U.S.
Debs said the REIT has been in discussions with Landmark for more than a year as the U.S. apartment trust mulled the merits of an initial public offering or an outright sale. The arrival of Greenwich, Conn.-based private equity group Starwood made it possible for Milestone to acquire a large portion of Landmark’s assets. Starwood, on the other hand, is going to hold those older properties “as value-add products,” he said. The portfolio acquisition is “in line with the REIT’s growth strategy to high-grade its portfolio and improve its operating margins and cash flow position,” the REIT said in its announcement of the deal. The deal increases the REIT’s scale in seven of its existing U.S. Sunbelt markets. It also boosts its property management business as Milestone will be retained by Starwood to property manage the portfolio of 63 properties acquired from Landmark (19,615 units). This will increase the total number of units managed by the REIT to over 50,000 units. “It does change us in a lot of positive ways,” said Debs. “It makes us bigger; we are going to own 4,000 units, all of which have a year-build (average) of 2005, so it is going to continue to upgrade our portfolio which is what we have been looking to do since we IPO’d. The new Landmark portfolio fits with Milestone’s strategy of acquiring properties in major metro markets in the U.S. Sunbelt that display population and employment growth rates higher than the U.S. national average, boast extensive amenities and are located close to shopping, dining, and entertainment options, as well as major transportation corridors and employment centres. The 15 properties are located in Charlotte (four), Atlanta (two), Orlando, and in Texas (Austin, Dallas/Fort Worth, Houston and San Antonio. Milestone said the properties are being acquired at an average year one cap rate of approximately 6.1 per cent and an average price per unit of approximately US$120,000. 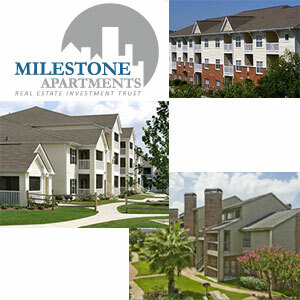 Milestone will continue with its business plan of adding new assets and disposing from time to time of older properties. It currently has a trio of properties on the auction block: Ivy Commons (Atlanta – 344 units), Parks at Treepoint (Dallas / Fort Worth – 586 units), Post Oak Place (Dallas / Fort Worth – 354 units) and Brookfield (Houston – 250 units). It will continue to focus on the U.S. Sunbelt, a region which promises sweet spot demographics and economic growth, said Debs.